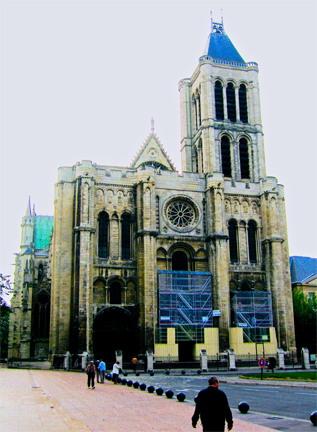 St. Denis is located in a region known as the Ile de France, a region that virtually surrounds Paris. The area is the ancient heartland of France, the basic core from which French kings extended their power, both in their own country and throughout Europe. Historically tracing its origins to the time of Julius Caesar and his seizing of control from the barbaric Gauls, the region has played an intimate role in French development encompassing both facts and legends, from Caesar to Charlemagne to Napoleon. Walls parting and allowing light to enter. 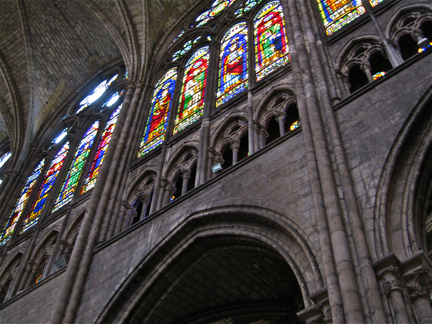 Stained glass in the parted openings infusing the interior with spirituality and learning. 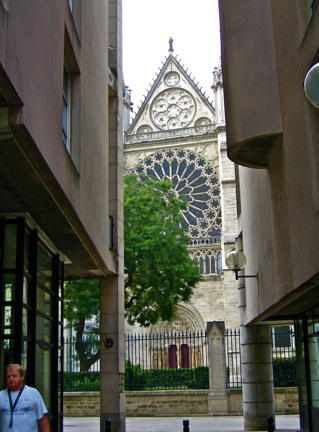 We’ll get back to the Abbot and his church in just a bit, but first some background on the location of St. Denis. 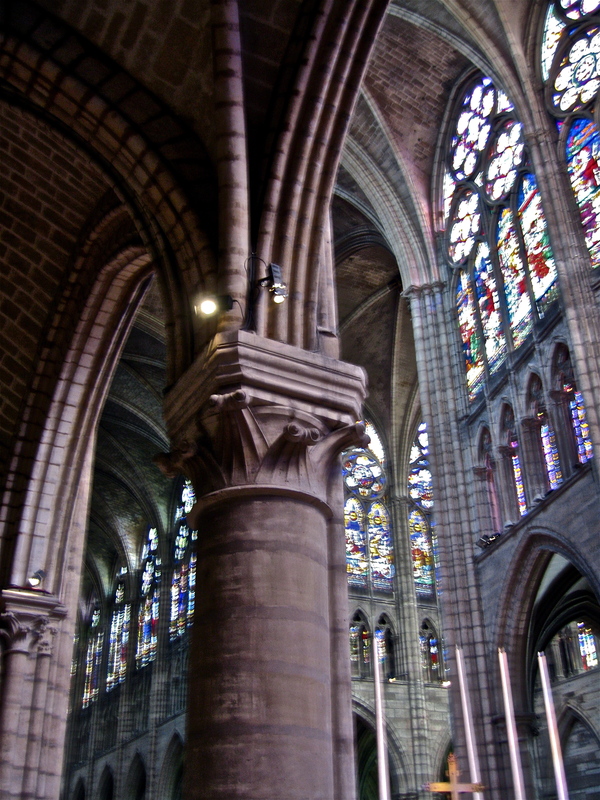 Though still Romanesque in many features, St. Denis is probably the earliest building that contains truly Gothic structural elements. It is more than appropriate that this church, beginning a movement, which was to see France lead the Western world in a major innovative architectural transformation, is situated in the spiritual as well as the governmental heart of France. Bishop Suger began construction of the church, as we know it today, in about 1140. 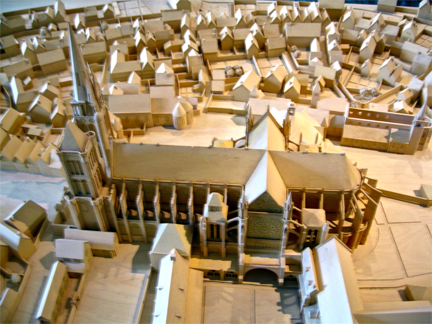 In the block model above, the red segments show work completed within the 12th century, notably the narthex and the southwest tower, which is what remains today – tower-wise. An illustration further below will show the northwest tower and spire, which existed previously. Do note the red area located within the structure of the apse to the extreme left. Now to that red area shown within the apse. Apparently this represents work designed and completed by Abbot Suger, beginning in 1140. 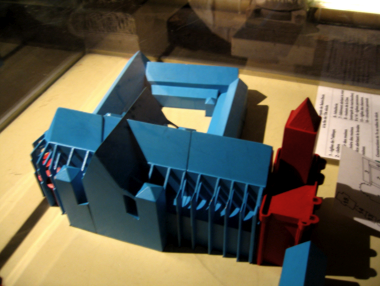 It would appear he created the apse, as is often noted in texts, but NOT the high structure we see today enclosing that apse (the blue model part). That was commenced nearly a century later, in 1231. Thus it can be assumed that Suger’s quest for light and its effects upon congregants was probably not realized in his lifetime, but that which we do see today is certainly a manifestation of his creative striving. 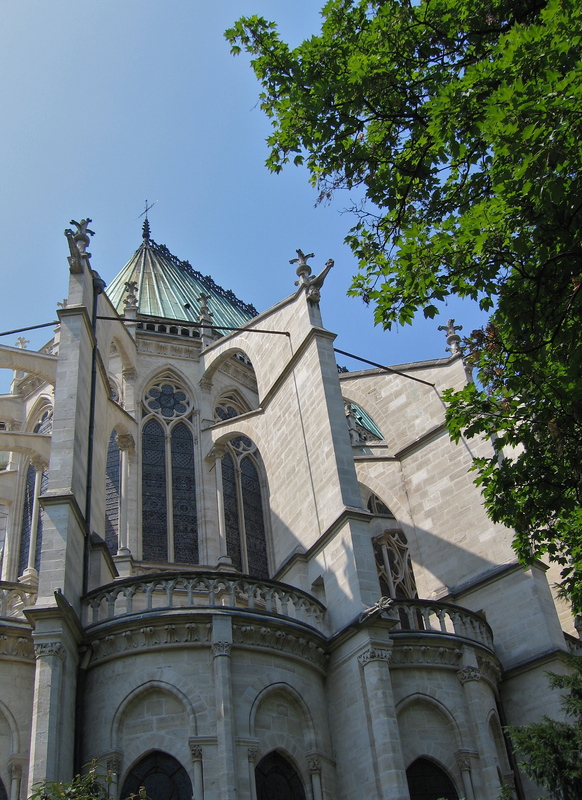 The front elevation of St. Denis, the west façade, follows the concept seen in the Abbey aux Hommes in Caen. Basically, the three-aisled church is represented by three arched portals (two unfortunately hidden by scaffolding), and is presently flanked by one quite vertical bell tower, very much as can be seen in Caen. 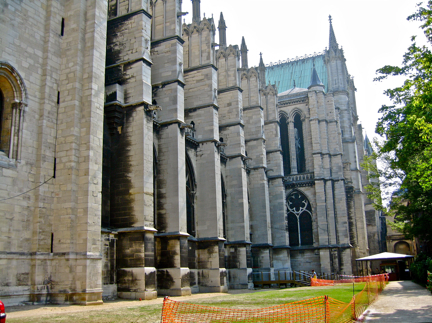 One aside here – for whatever reasons - economic, time, collapse, or fire – most French Gothic churches of significant stature have markedly different and/or incomplete flanking western towers. As we progress in this Chapter, do refer back to St. Etienne, the Abbey aux Hommes in Caen, and note its twin towers are replete with spires. Those spires, as noted earlier, were completed in the 13th century. I do not think we shall see such completeness again. 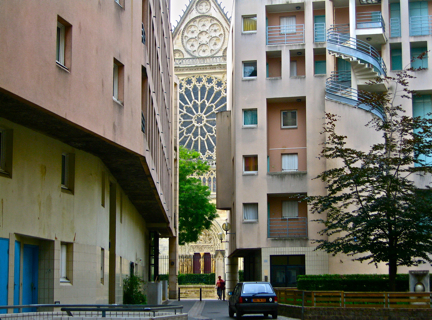 The façade of St. Denis is said to have emulated that of St. Etienne. This drawing shows two towers as well as two spires, although the latter of differing heights. Apparently, as described in French, lightning struck the north (left) tower with such force as to require complete demolition of the tower. 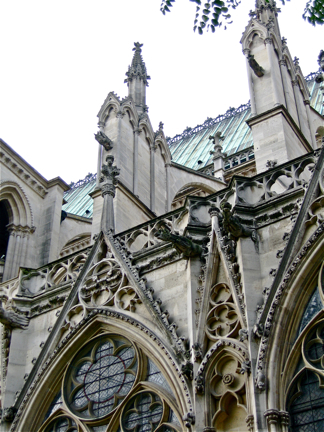 But it would be interesting to determine if those spires were constructed after the spires of St. Etienne. The hand-written description states 13th century construction. It has also been noted by historians that the three-arched façade of so many churches possibly was inspired by the Roman arches, particularly that of Constantine in Rome. But the French did not have to go that far for inspiration, if such was indeed the case. They had merely to look at the triumphal Roman arch in Reims, the Gate of Mars, one of four erected about 200 A.D., setting up the major axes of that city. 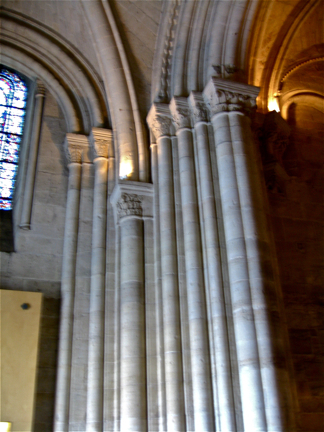 This is but one of the three arches within that arch of triumph in Reims. 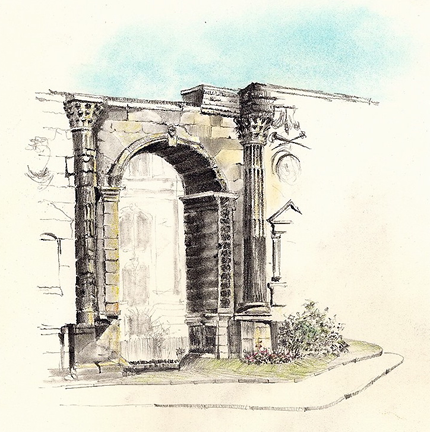 Sometimes it is difficult to find sketching time when traveling with students, which was the case on this trip, and all I could capture was one of the three arches. This particular arch of triumph is reputed to be the largest ever erected in the Roman Empire. So the three-arched motif was known; what is not known is whether precedent of design was affixed to church construction, or more likely the interior plan of nave flanked by side aisles led directly to each aisle having a door. We really have to be careful in analyzing effects, trying to attach meaning or precedent where it is possible that none exists. 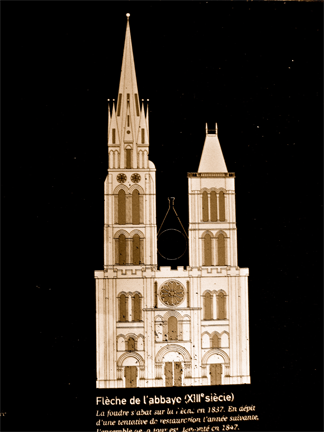 The following detailed model shows the church as it appeared as recently as the mid-nineteenth century. There is more to the story of the northwest spire. In 1837, following the lightning strike, the tower was rebuilt by an architect named Francois Debret. 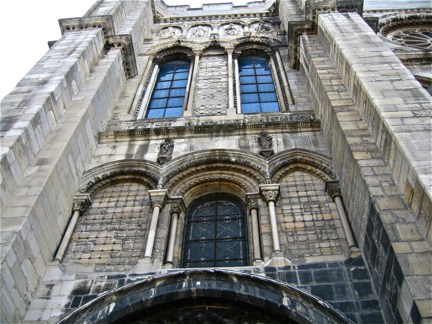 For whatever reason – some sources indicate complete ineptitude of the architect, both structurally as well as aesthetically (he apparently invented his own restoration details elsewhere on and within the cathedral) - it was determined that the tower was about to collapse, and it was demolished in 1846. 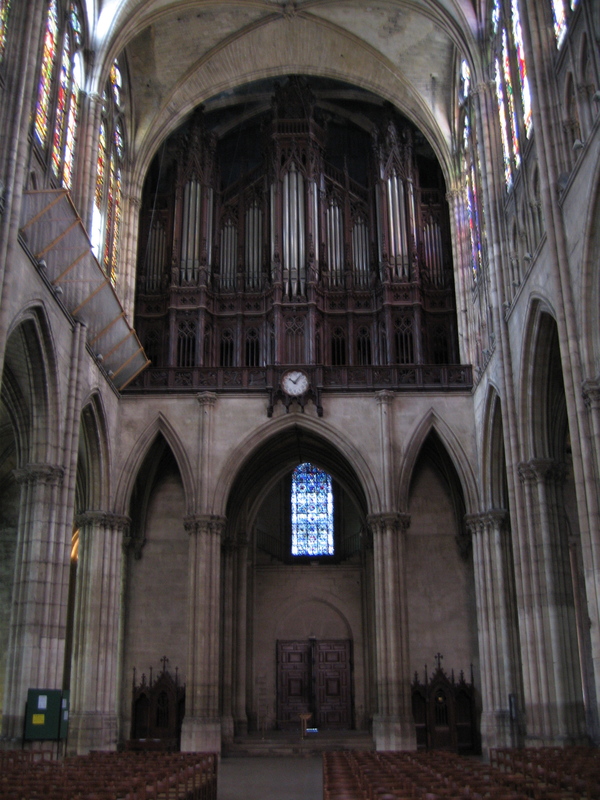 Let us look at Saint-Denis a bit before we get into more detail. Let’s go back to the beginning. 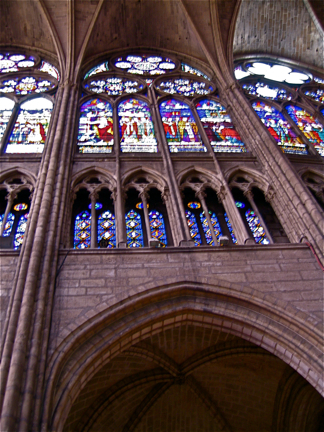 The first glimpse was approaching through adjacent buildings, and the view was that of the north transept, which beckoned us forward in the mode of serial vision. Here we have stepped back a bit. Then closer, as seen previously. The apse, off to our left, or east, the usual position of the apse in Europe (the eastern end). Planners love to point out that catching but a glimpse of a building leads to anticipation, as opposed to seeing everything all at once. Try that on your own, and think about it as you are doing it. And now off to the western entrance to our right. Amazing intricate stonework, which dimensionally separates this decorative skin from the main form of the cathedral, giving the impression of a non-solid. This leads to the spirituality of the volume, as fingers of stone reach for the heavens and jut out into space. 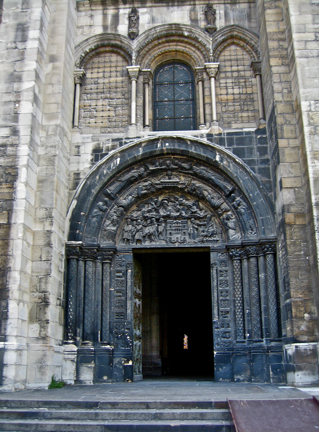 Back to the western façade, looking up over the left entrance door. Before we go in, rounding the corner of the west facade and taking a look at the south side. Now we will enter through the only accessible door at the moment, leading to the left (north) side aisle. But wait one moment, as we glance upward, above the entrance tympanum. 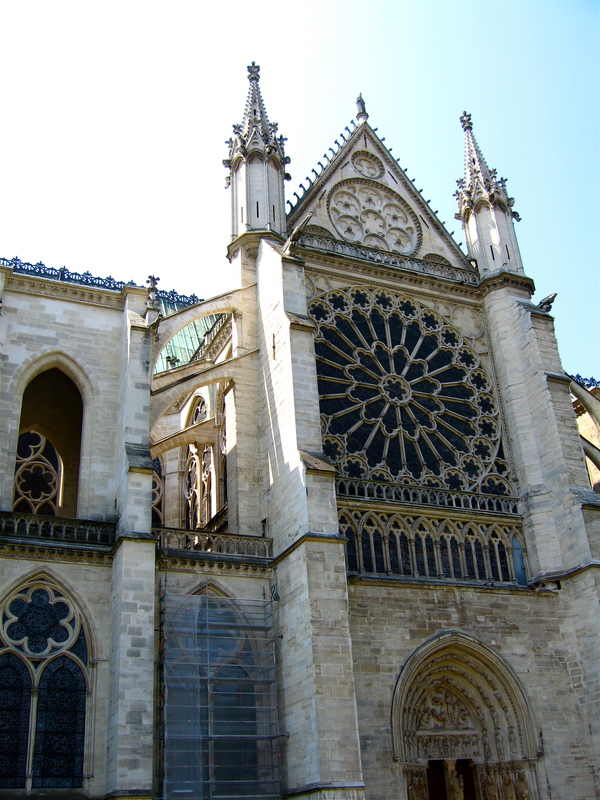 St. Denis apparently has the first known rose window, which was to become a hallmark of Gothic facades. 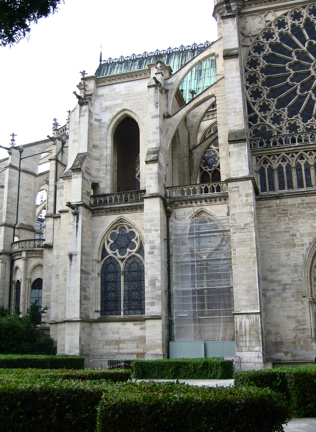 There are a number of explanations for the shape and eventual character of these rose windows. Conceivably the rose is representative of the Virgin Mary. Question is, however, which came first: the notion of the allegorical rose to then be translated into stone webbing filled with glass, or the window and its stone tracery which resembled petals of a rose, giving rise to the representation. 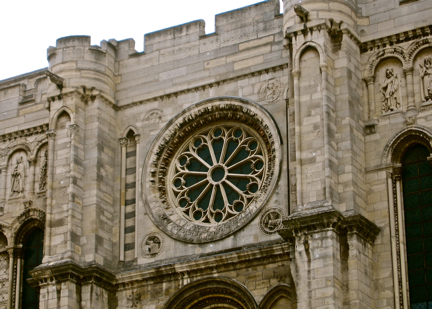 Vincent Scully suggests that circular medallions found on the Arch of Constantine might have inspired this particular rose window. Scully offers yet another thought – that of the fact some Rhineland churches had a number of round windows punched into their walls. 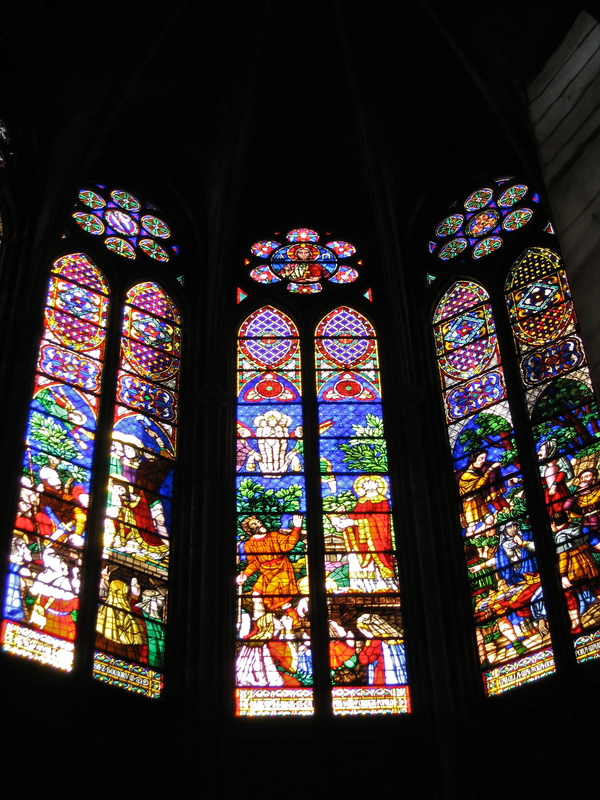 Since Charlemagne had actually built a church on the site (early 9th century) where St. Denis had been martyred in 270 A.D., a connection could be made to the Rhineland church windows. See St. Etienne in Nevers above to decide. 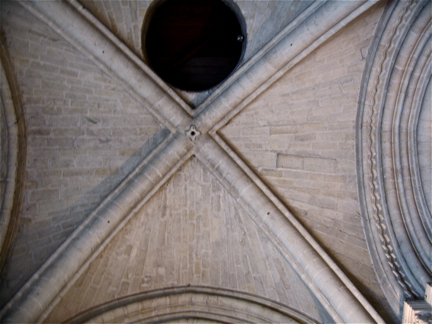 Further on this subject - since a number of openings in earlier church facades assumed the shape of semi-circles, quite possibly because the arched construction was far more able to support massive stone above those openings, did it just pop into the minds of architects or masons that a complete circle was just as viable, and perhaps more aesthetically pleasing? Bear in mind that portholes in the sides of wooden ships were round, because shifting forces produced by movement and pressure in the water would otherwise mangle a rectilinear opening. Forces of stone weights would similarly go around the arched opening - a semi-circle is, of course, an arch. This principle goes back to Roman times (see Chapters One and Four). There is one other possible explanation: the concept of infinity is embodied in a circle in that there is neither beginning nor end to a circle as it is viewed. Infinity can certainly be linked to eternity, and thus a most appropriate symbol for a religious structure: the rose window! Perhaps someone pursuing a Doctorate might want to delve into this. My research has never found a satisfactory answer to the reason behind the new design. Incidentally, the semi-circular opening has been described as “the vault of heaven.” Note also in Mycenae above, there are round grave circles, possibly epitomizing an eternal resting place, equating to the concept of infinity, thus coming full circle (no pun intended) in our quest for the origin of the rose window. 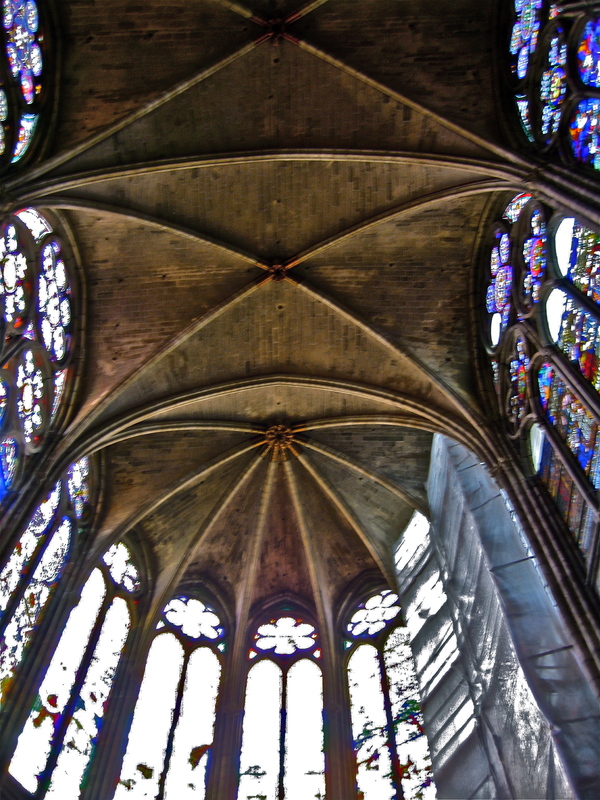 In any event, the French mastered the art of stained glass, and the rose windows of French Gothic cathedrals, being composed of stained glass, impart auras of joy and spirituality, and actually make you forget that you are looking at a gigantic hole punched out of a massive stone wall. And until some in situ writing appears which indicates a link between the rose window and the round medallions of Roman arches of triumph, I will not accept that particular premise. Inside at last, looking down the north ambulatory. Now for some details. 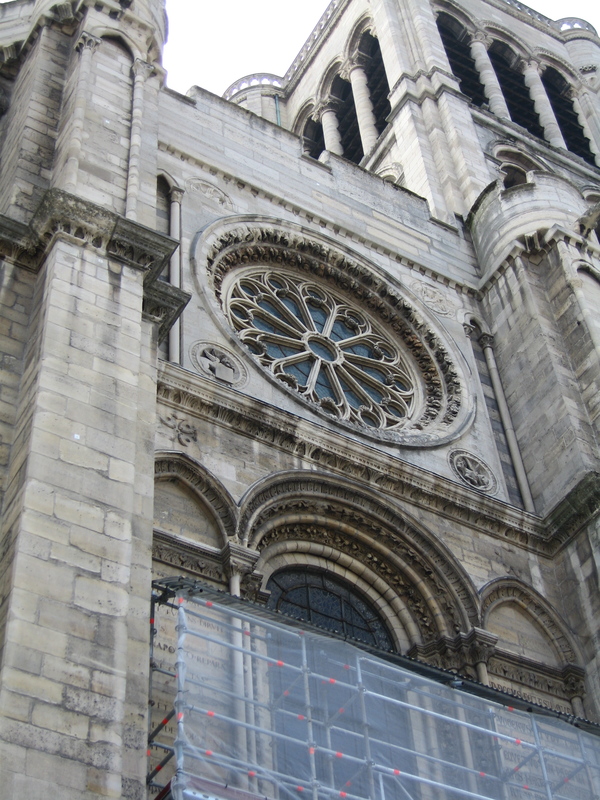 The rose window, seen from outside the church, appears to be completely obscured by the organ loft inside. 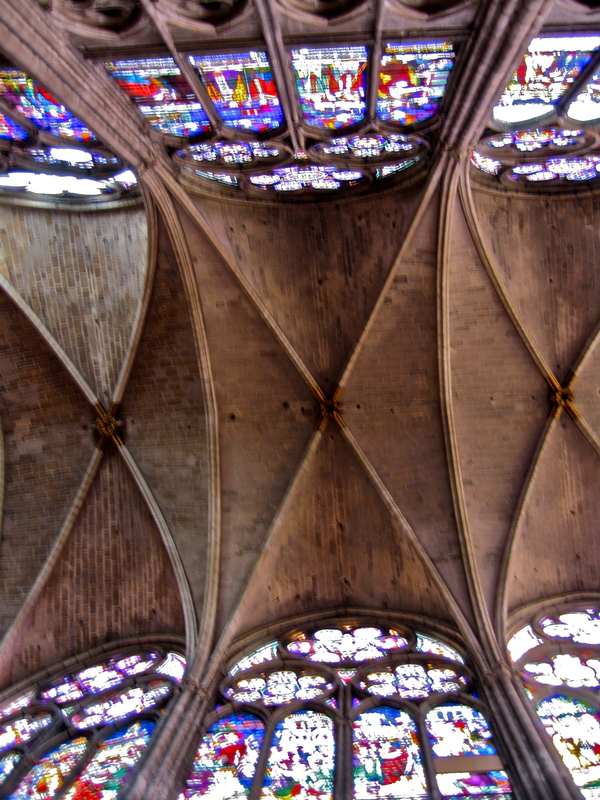 But to attempt to understand the construction necessary to provide for the rose window, Suger created vaults of articulated ribs, which he buried inside supporting piers of the narthex. The resultant bays of construction were much like Roman groin vaults, except for the fact that they were created from ribs, as opposed to curved planes of masonry. 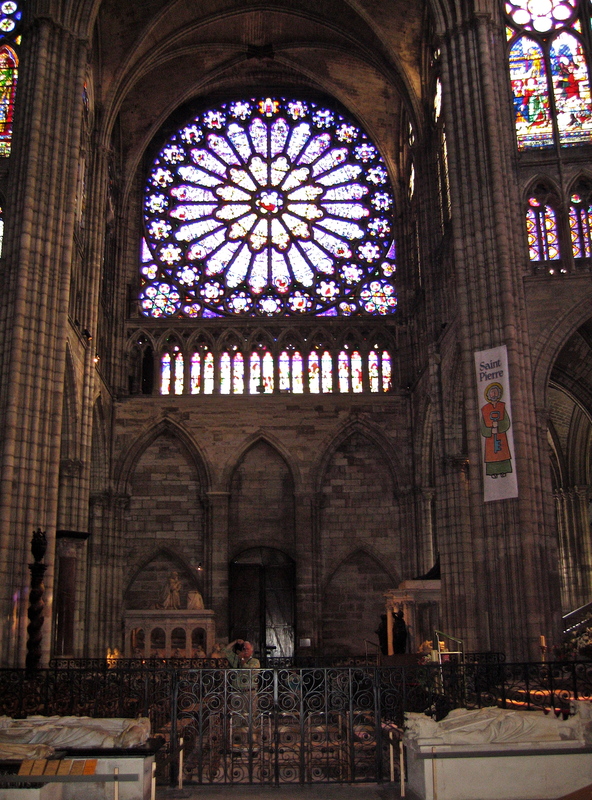 The north transept rose window as seen both from the exterior as well as the interior. 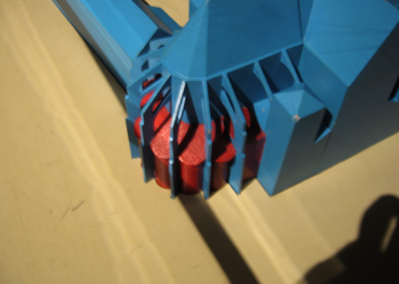 Suger was able to create a succession of spatial openers, which let in light. 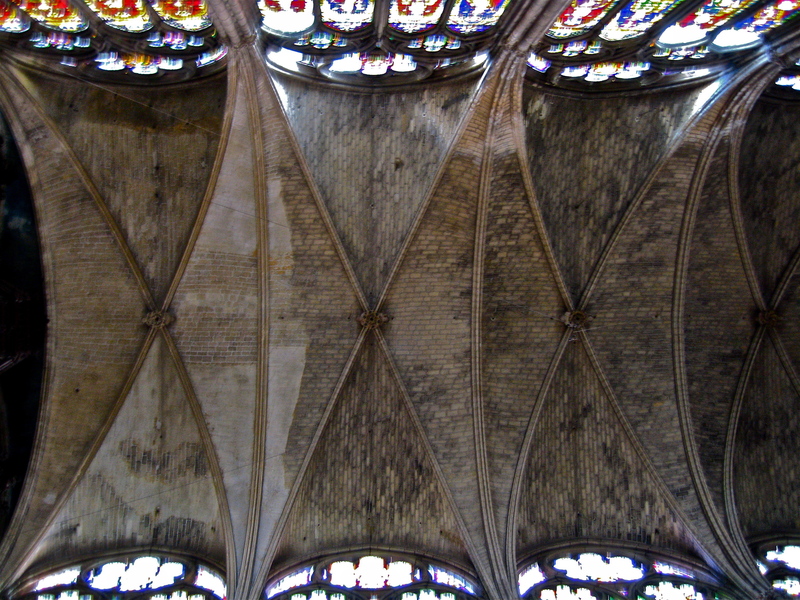 These are nave bays, and it is possible that Suger laid out the scheme, which was left unfinished at the time of the Abbot’s death in 1151. 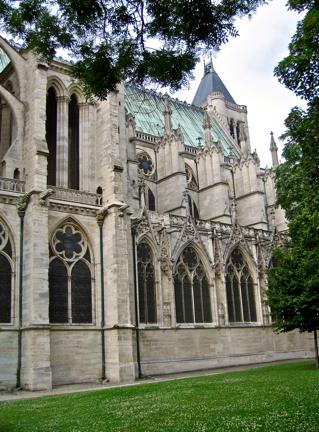 Work was begun again in 1231 under the direction of Abbot Eudes Clément, and the nave was completed in 1281. Actually, the name of the first architect to succeed Suger is not known, but credit is given to a succeeding architect Pierre de Montreuil, who worked until his own death in 1267. 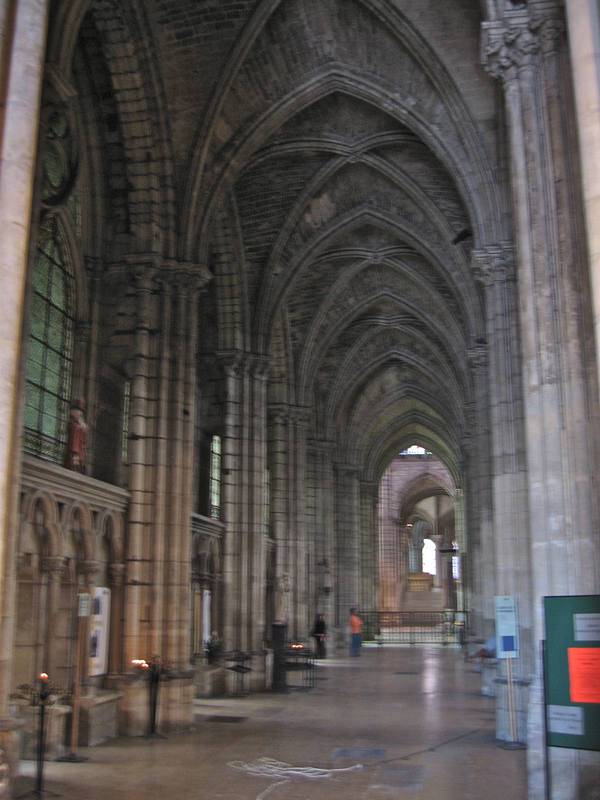 Nave arcade, topped by the triforium gallery, and then the clerestory. Suger then went on to create a choir in the apse (a not-disputed fact), developing his rib concept to allow for even more greater openings, allowing more light than had existed in earlier constructions. He also minimized supports; another characteristic of what was becoming the Gothic movement. And this is the light Suger was striving for, as mastered by French stained glass artisans, in work created in the 13th century..
Interestingly, there was no questioning of the mysticism evoked by Gothic architecture. And that faith transferred itself to religious ideology. Architecture became a catalyst for belief, paradoxically through its almost unbelievable achievements of structural forms. The logic of engineering - logical to its creators – became a source of mystery to the congregants, a visible mystery, symbolic of their God. Spatial effects became the symbol for God. The ultimate reality had become the ultimate mystery. 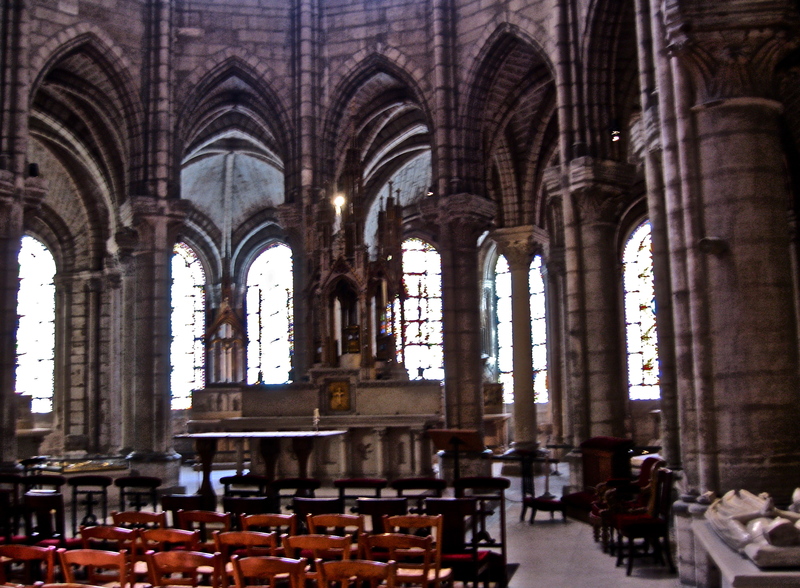 To medieval man, knowledge was attainable only after death; its symbol: the cathedral. Contrast this to modern man for whom knowledge is something to be found in this life, its symbol: the laboratory. Before we leave, some dizzying shots of the interior. 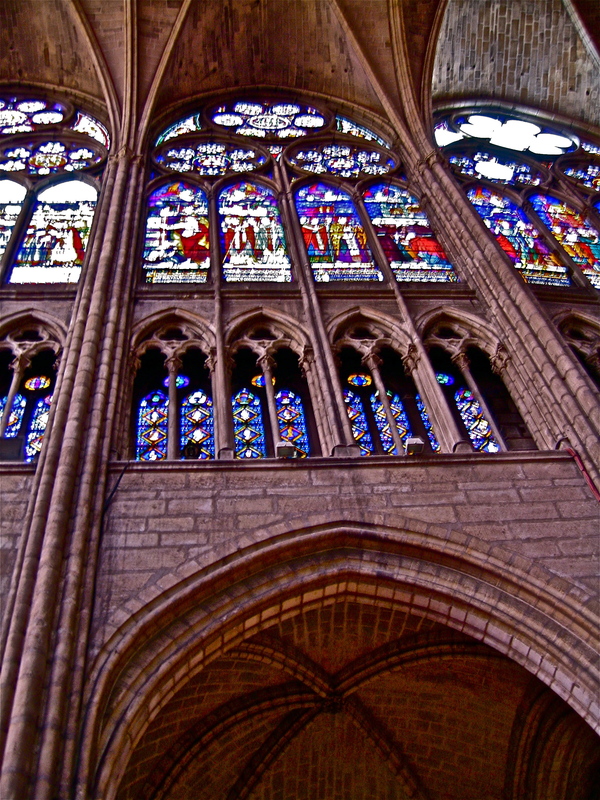 The pointed arch of a nave bay, topped by the triforium gallery opening with stained glass windows beyond, and above - the clerestory. Note the articulated piers with ribs soaring upwards. And when I wrote “dizzying” I actually did mean just that. 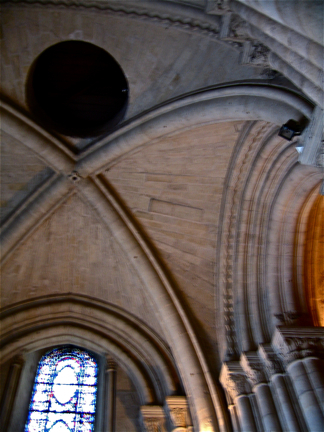 Perfect examples of quadripartite vaulting above the nave – like billowing canopies, ethereal in their effect.